Looking for cheap Houston electric rates but have bad credit? Check out these great prepaid plans that can save you money. 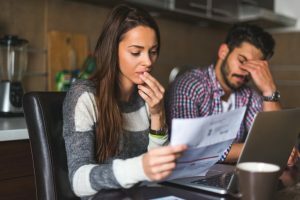 Can bad credit stop me from getting Houston electricity service? Bad credit isn’t always caused by an individual’s reckless spending. In fact, the number one reason Americans file for bankruptcy is medical debt. Even people with health insurance can fall victim to catastrophic medical expenses that eat away personal savings and other assets. If you’ve fallen into bankruptcy or even if you just have run-of-the-mill bad credit, buying the things you need in daily life can be a challenge. For fixed rate electricity plans, retail electricity providers check new customers’ credit. If a customer’s credit isn’t up to snuff in the provider’s view, the customer has to fork over a big deposit. When you have bad credit, a deposit can be a financial burden. But you have other options! Prepaid electricity plans allow you to obtain electricity service without paying a deposit. Plus, you have no contract, so you can switch providers at any time without penalty. It works in a straightforward manner: you pay in advance, and the electricity provider charges you the daily going rate plus any base charges and utility company charges. The Pogo Energy plan has the best rate for moderate and high usage customers. However, the Payless Power and Hello Energy plans have flat rates across usages and work better for low usage households. With all prepaid plans, the price you pay fluctuates with the Texas electricity market, so your electricity expenses will be higher in the heat of the summer and the cold of winter. Prepare your monthly budget for this, and you won’t feel the sting as intensely. If you get to the point where you can afford a deposit, you should compare prices when the Texas weather is temperate. Fall and spring are when you can lock in the best prices of the year on fixed rate electricity plans. Whether you want a pay-as-you-go plan or a fixed rate contract, your first stop on your Houston electricity plan search is Texas Electricity Ratings. Compare prices, and if you find a better plan for your home, switching Texas electricity plans is easy. Sign up for service through Texas Electricity Ratings, and your new retail electricity provider will help you cancel your old plan and start your new one without any interruption in service.